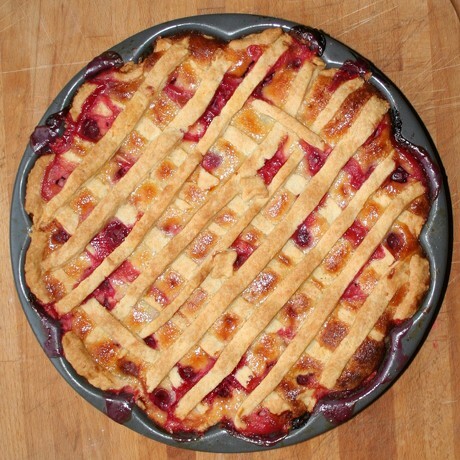 This month’s edition of the „Waiter, there’s something in my…“ event ist hosted by Cooksister and calls all cooks to make pie. I’ve been giving this event some thought and serious cookbook reading, searching the internet for lots of new and cool ideas, and decided I would make a savory pie, maybe the cottage pie from Sarah Freemans The Best of Modern British Cookery , a terrific book showing off the best of the isles‘ cuisine aside from Gary R., Rick S. or Jamie O..
Inevitably, because a recent census of the inhabitants of my freezer resulted in several ice cream boxes filled to the brim with gooseberries – the gooseberries in my in-laws‘ garden have been producing bumper crops for three subsequent years, and everyone got tired of them. Don’t get me wrong, I love gooseberries. I have made gooseberry jams (with banana, a great hit – with orange, not so convincing – with passionfruit, a nice one), gooseberry curd, gooseberry and elderflower ice cream following a Delia Smith recipe (definitely one of my favorites!) and lots of gooseberry cakes, tarts, and pies, with meringue, with coconut, with cream, plain, and so on. But enough is enough, so off to the freezer they went. And come up in winter just right to be the stars in a blogging event entry – how’s that for a career change! I wanted to make something new, so the old TNT favorites were out of the question. Finally, I settled for a combination of two recipes – a Flaky Cream Cheese Pastry Crust from epicurious.com, credited to Rose Levy Beranbaums Pie and Pastry Bible , and a Sour Cream Gooseberry Pie at allrecipes.com. While I loved the idea of a pie crust with cream cheese, the procedure seemed way too much of a hassle to me and I opted for a shortcut. Instead of the lengthy kneading process involving plastic bags and crumbling and many steps, I made a ‚cake mix‘ with cream cheese and flour and baking powder, put that in the refrigerator to chill, and the added all the other ingredients to make a shortcrust pastry just like mom – by hand, no hassle. Because too much hassle is exactly what I won’t have baking a pie. I have given the amounts from the original recipe below, but I sort of winged it at least with the gooseberries – a 1 litre ice cream box seems to hold exactly the right amount for my pie plate or the springform pan (probably a little more than 2 cups). 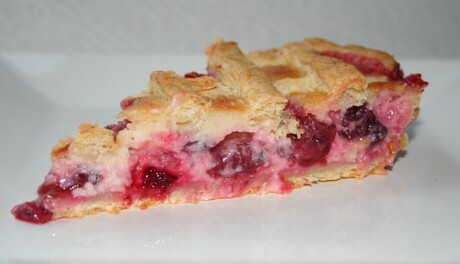 I did have too little crust, after all, even making a double-crust recipe, probably because I used a large flower-shaped pie plate, so I had to make a last minute adaptation to a lattice pie instead of a double crust. The only little limit we have set, though, is that it must be a closed pie – in other words, no flans or tarts or quiches. The filling must be invisible when the pie is served. Place the flour, salt, and baking powder in a medium bowl and whisk to combine. Add the cream cheese and rub the mixture between your fingers to blend the cream cheese into the flour until it resembles coarse meal. Cool 15 minutes in the refrigerator. Add the remaining ingredients staring with the butter and knead into a smooth shortcrust pastry. Cool for at least 30 minutes. Halve the dough (approximately, 1 larger half is fine). Use the larger part of the dough for the bottom crust. Roll out between sheets of cling foil to prevent sticking. Roll out second crust a tad smaller than the first. Preheat the oven to 350℉ (175℉ C). In a medium bowl, gently stir together the gooseberries and sugar. Let stand for 15 minutes. Press one of the pie crusts into the bottom and up the sides of a 9 inch pie plate. In a medium bowl, stir together the flour and salt. Mix in the sour cream, eggs and vanilla. Add the gooseberry and sugar mixture, and stir to coat evenly. 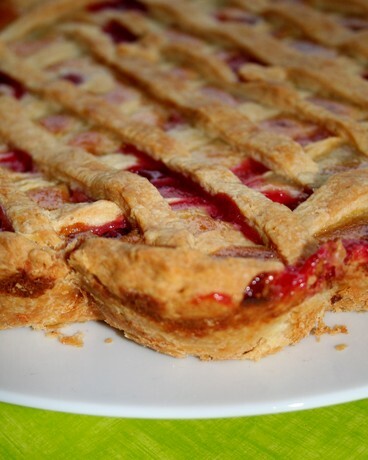 Spoon into the pie crust, cut second disk of dough into thin strips and make a lattice top. Bake for 55 minutes in the preheated oven. Cool to room temperature, then refrigerate until serving (needs to set). As it turns out, the pie crust was fabulous – even without the extra effort required by Mrs. Beranbaum (just as I had assumed). The complete roundup for the event can be found here.